There are several ways to give financial support. Donate funds directly online through our secure Network for Good system. Join our our fundraising events and have fun while you give. ​Or simply send a check to Habitat for Humanity of Ellis County, PO Box 444, Hays KS 67601. ​Ellis County has a severe shortage of affordable homes for low-wage working families. You can be part of the solution and help create more homes for our hardworking neighbors! 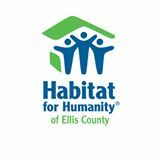 Habitat for Humanity of Ellis County, Kansas is a tax-exempt 501(C)(3) nonprofit organization.